Blanket storage chest or Crock-Pot? 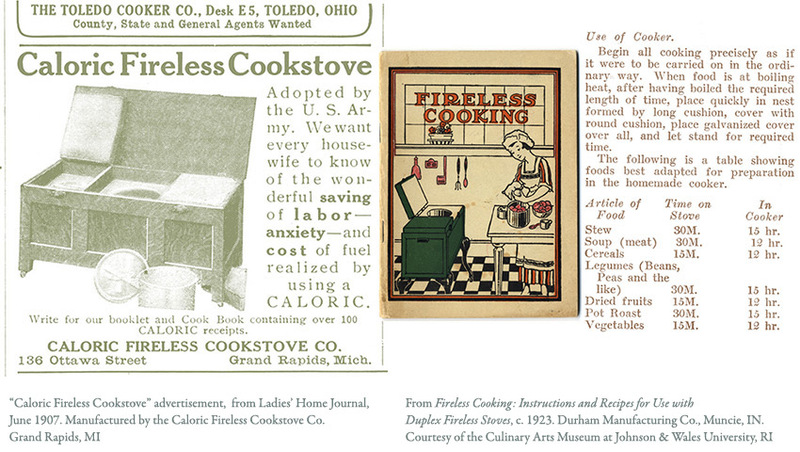 From the mid-1800s to about 1930, cooks who "set it and forget it" probably used a fireless cooker. 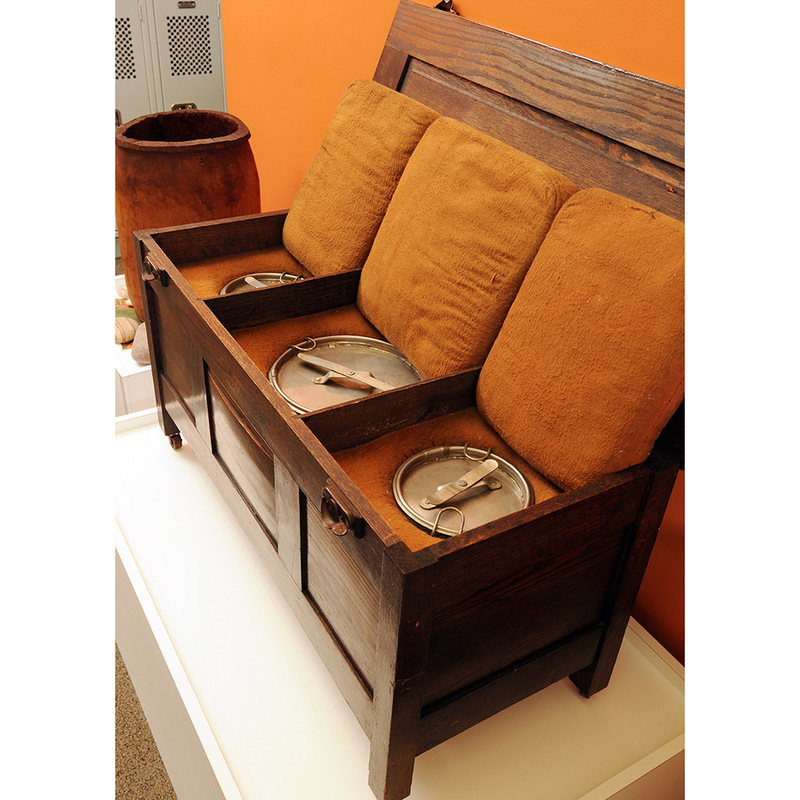 Since ancient times and across cultures, various utensils have cooked food with conserved heat. Medieval Europeans stuffed straw around their slow cookers, called "hayboxes," and 20th-century versions, as this unit reveals, still used straw-filled pillows to surround and insulate the three hot food containers. Snap-tight lids sealed the one eight-quart and two four-quart pots. 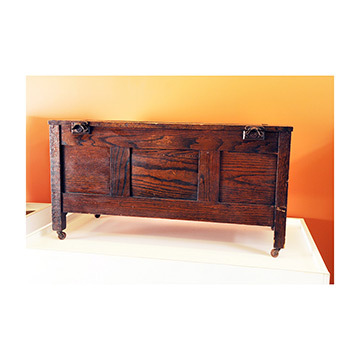 Most cookers were metal boxes; this fireless cooker's wooden cabinet was fashioned in Grand Rapids, a center of American furniture craftsmanship in the early 20th century. The word calorie, as a measure of food energy, first entered the English language in the mid-1800s. The Caloric Company based its name on the same Latin root—calere, meaning "to be warm"—to reinforce the connection of fuel conservation and energy. 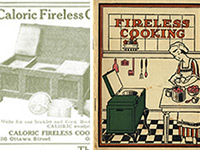 The Fireless Cooking recipe book explains that "the word 'fireless' is a misnomer. The proper word is 'recalorator,' which literally means the conserving of heat, just as 'refrigerator' means the conserving of cold." The Caloric Model No. 3 provided soapstone disks, or "radiators," to be heated on a stove and then placed with tongs under and above the aluminum food container to raise or sustain the temperature inside. Wire baskets protected pies and cakes. Multicompartment utensils for greater cooking flexibility were sold separately.